Those of you who pay for YouTube Red may know that for a while it's been possible to listen to music on YouTube Music without a connection with the offline mixtape feature. It's not the ideal solution, as it auto-populates based on your listening history. You can remove songs from it, but many users would prefer to choose which songs go on the list, too. 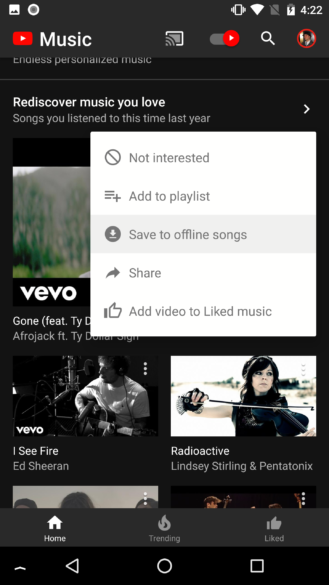 At some point recently, the option to save specific songs to an offline playlist was added to the app, something which we thought you might like to know about. Left: the 'save to offline' option. Right: accessible from the Offline settings menu. Google confirmed the feature in the latest changelog, but we know it's been there since at least the v.1.82.10 update from June 21st. As you can see from the screenshot on the left above, the 3 dots menu for a song now includes a 'Save to offline songs' option. 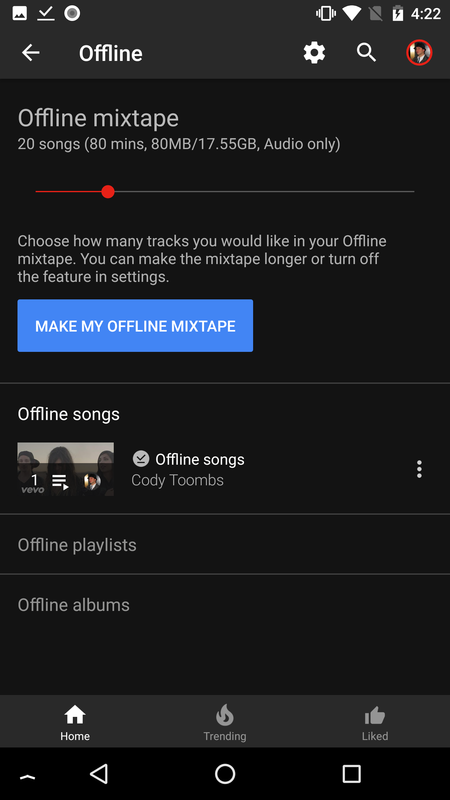 You'll see the same behavior for playlists and albums, and they can all be accessed and played in the 'Offline' section of the app's settings (above right), just below the offline mixtape preferences. The new feature is also outlined on the help page. New: YouTube Red members can now take songs, albums, and playlists offline to keep listening without a connection. I've not been able to try this out myself as YouTube Red/Music isn't available here in the UK, but as you can see from the screenshots, Cody has tested it out and it seems to work well. This is great news for subscribers to the service, as although the offline mixtape was probably good enough for some, many will have been hoping for this greater control for some time. Let us know what you make of the new functionality in the comments. If you don't have it already, you can download the app from the Play Store link below, or grab the latest version from APKMirror.